I've started one more blues crumbs project. 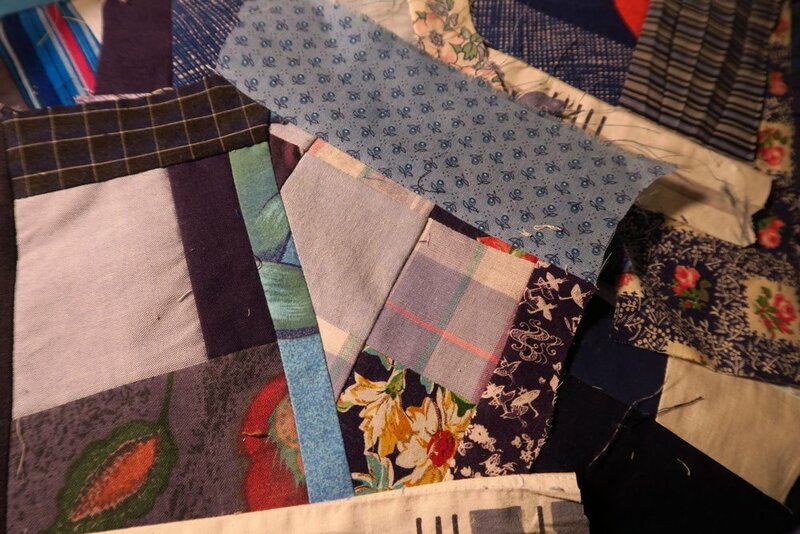 I probably have enough small pieces for more than one crumbs quilt with blues, but I am not committing to it. i may just mix my leftover blues with all my other crumbs/strings pieces once I finish this one. A person can only take so much blue - even someone who loves blue! All I did this past weekend was make some crumbs blocks. That's all. Actually all I did was make some crumbs fabric - I haven't even cut the blocks from those pieces of "made fabric" yet! First and most importantly, I was all over the place with my focus this past weekend. In other words, I had no focus. Yeah. it was terrible. I was flitting here and there, checking to see what the kids needed. With Saturday being a holiday - stores all closed, and Sunday being a normally high pressure day for me - I was feeling it. One other thing - a handicapped couple in our church moved to an assisted living facility farther away than they used to live and I had to make sure I could get there in time to pick them up and get them to church - new location and all, and my husband not here...I was really feeling the pressure since I'm the pianist. The comforting thought was that Daniel pointed out , "Mom, we're not starting without you!" Well said. I made it in time. Google maps is a wonderful thing! Then, I was also trying to get rid of some "stuff" in our basement like a couch and some chairs - that I needed the kids' help with. It was that kind of a weekend for me! The second reason is, that while I thought I knew what I was going to do, I'm not sure anymore. I'm thinking of tweaking the design a bit (ha!) and doing something else. It is going to be crumb stars or a big star - that much I know, but the details are fuzzy. Seems like that's just my life these days. I got to thinking that my original plan was too similar to the one I just finished - as to the overall look. I think I'd like to go something different. Whatever I do, I do know I need a LOT of crumby blocks! So that's what I did...I just made "made fabric" from pieces. These aren't terribly small pieces - most of them - so we'll see how the end result is. Many of them are trimmings and ends of shirt tails or pieces that were just too hard to actually use in 2.5" or 2" squares. So, it's not real exciting - but not every day is all that "heart-stopping" thrilling, right? I hope not! Hopefully by next report I'll have more to show you about my detailed plan - and by then I should have cut up more blocks and be able to show you what I'm up to on this one. Time for some charity quilt focus!